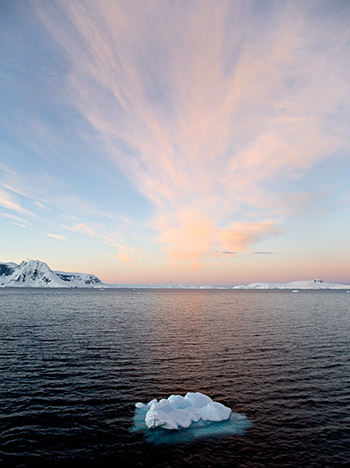 IMAGE: Small Iceberg at Sunset; Antarctica - December, 2005. (taken with Cano 5D with 24-105mm f/4L IS lens @ ISO 400). Thanks very much for the terrific photos stored at Michael Reichmann's The Lumionous Landscape photo archive. Below is the text of our "Climate Call to Action", sent out to coincide with the start of the screening of An Inconvenient Truth in Australia, and of former US Vice-president Al Gore's visit to Australia. The email was sent to all our supporters and contacts between 16 and 19 September 2006. This mailout was also our first occasion where we made the cross-over from 'refugee issues' to Climate Justice as a human right. (we know, it's highly unusual for a Project SafeCom mailout, but this email includes a small attachment, as a pdf file, which opens with Adobe Acrobat Reader program - the attachment is our New Climate Justice brochure - and, our apologies if you receive this message more than once! Four Corners: "What Price Global Warming"
So this week, of all weeks in the year, seems a most opportune week to send you Project SafeCom's 'brand-new' publication - the brochure From Climate Change to Climate Justice. If you're connected to Project SafeCom because of your concern about Australia's treatment of refugees and asylum seekers and refugees, and you're wondering what the connection is, please read it, and you'll be convinced. Below are some snippets of information that may further inform you - from those programs on Australian television that give at least an impression of where we're at - and that are not "cooked up" by government influences that seek to bury the State of the Planet under the proverbial carpet. If you've already opened the attachment, you'll see that it's easy to print: one A4 page, printed on both sides; fold it in three, and there you have it. We've broken the spell, and supported an entire stop to the use of coal as a fossil fuel as well: it's the planet worst polluter! if you do not have a printer, send this email, including the attachment, to your friends and contacts. Be sure to be present at a cinema where the movie An Inconvenient Truth is showing. Stand in the exit space when the movie finishes and hand out the brochure. Why? Tens of thousands of people are actively starting to look to link up with organisations that can inform them, empower them "to do something" and who are telling things as they are! We're highly unlikely to have "instant success", for example in demanding that we in Australia stop using coal to make electricity. Below is an example of just this week how the Environment minister Senator Ian Campbell dismissed the alarm about global warming as "a Y2K bug story"... And, as if that's not enough, Resources Minister Ian Macfarlane added to the discrediting of Al Gore and stated that he was just in Australia to "promote his movie", thus trying to discredit Mr Gore's commitment and intent. In addition to this, the ALP opposition may well claim the "moral high ground", but there is no indication in the recently released ALP policy that it shows any commitment to halting the use of coal for this purpose, or halting any form of coal production. Therefore, below also, a link to the ALP policy release media reports. If we suggest a halt to coal production and its use in Australia, we'll also have a fight with the Union movement, that wants to protect jobs.... but the well-being of the planet is a thousand times more important than the welfare of the "golden calf of the economy": we can no longer afford to only think of the environment and link that to the supposed loss of jobs or the welfare of the economy! spotted on Julian Burnside's website: "Inconvenient Truth: if you do not see it, your children will not forgive you"
This week is surely an extraordinary week in Australia, with the former vice-president of the US, Al Gore, visiting Australia to accompany his documentary 'An Inconvenient Truth', meeting with John Howard and declaring his hand on what he thinks of the Australian government's undermining of the interests of its most significant voter: Planet Earth. Al Gore's appearance this week on Andrew Denton's Enough Rope saw Denton also name the term "Planetary Emergency", and I was glad he did. Four Corners 28 August 2006: "What Price Global Warming"
"The biggest single source of global greenhouse gas emissions is the burning of coal to produce electricity - and Australia is the world's biggest coal exporter." "... a growing cast of business leaders is calling for the Government to engage the power of the market in the fight against global warming. They say Australia needs a "carbon price signal" - either a tax on carbon dioxide, or better still an emissions trading system, which will give business a real economic incentive to save energy, cut emissions and invest in clean technology." Liz Minchin in the Torres Strait: Got that sinking feeling? Disclosure: Project SafeCom is an Incorporated Association in Western Australia. Since the days of the TAMPA stand-off in 2001, it has been able to support its full-time unsalaried operations. Since January 2006 it also operates from premises in South Fremantle. Project SafeCom does not receive public funding, but supports its work through memberships, donations, public events, and from the sale of books through its website. You can make a donation by transferring funds to our account at Bendigo Community Bank Kulin, BSB Number 633-000. Account name: Project SafeCom Inc., account 115643900, or by sending a cheque or money order to our address below.